A skiing break is a popular holiday choice for many young families. It does, however, require a great deal more planning than the average beach holiday when it comes to child safety and child care. Here are some top tips to ensure that your family skiing holiday goes smoothly. Whilst a swish hotel might be the perfect place for a romantic skiing break for two, it may not be the right choice when travelling with a young family. Some hotels, however, cater exclusively for children, offering child-friendly meals, child care facilities and family rooms. Why not consider staying in a chalet, whether catered or self catered? If you are concerned about your children being loud and disturbing other guests, this could be the ideal option for you. With plenty of space for children’s toys and freedom of movement, a chalet is often the best bet for a young family. Be sure to check ahead to see what facilities the chalet complex offers. It may be possible to request useful items such as high chairs, cots, changing mats and baby monitors. The location of your accommodation is also something to be considered. It is often advisable to be as close as possible to ski lifts, ski schools and amenities, as travelling on ski buses with young children and plenty of equipment can be problematic. Child friendly hotels and chalets often offer on-site child care such as kid’s clubs and crèches, allowing parents of young children time to explore the slopes. Those with older children should consider enrolling their young ones in a ski school. Be sure to choose a resort that offers comprehensive tuition for children, with a variety of groups tailored to different ages and abilities. Learning to ski will keep your children occupied and cared for for several hours a day. Indeed, many parents choose to combine a ski school with a child care programme. Carers can pick children up from ski school, giving parents time to perfect their skiing technique.Be sure to enquire about the qualifications and safety of any individuals who will be caring for your child. Whilst you may be embarrassed to ask, any reputable company will be more than happy to provide you with the necessary information. Wearing the correct skiing equipment is important for all but it is particularly vital when it comes to the safety and comfort of your child. 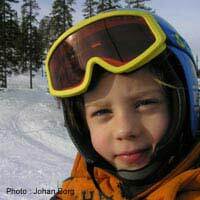 If your child is skiing, ensure that they wear goggles to protect their eyes from the strong sun. Non-skiing children can just wear sunglasses. Sun cream and lip balm with a high SPF should be worn by the whole family. Sunburn can be particularly painful for those with young, soft, pale skin. Specially designed ski socks are advisable, as feet can become sore at the end of a long day in ski boots. Never dress your child in two pairs of socks, as this can cause troublesome blisters. A jacket and salopettes are a better option than one pieces for young children, as they make toilet stops far easier. When it comes to a child’s clothing, layering is key. Children are likely to feel uncomfortable if they find themselves too hot and unable to remove any clothing. If you’re planning on treating your children to a week on the slopes, be sure to research your options carefully and plan in advance. You never know, if all goes well, you might have a future Olympic skier or two on your hands.